White porcelain Mother Nature's way (no unnatural whiteners or additives). 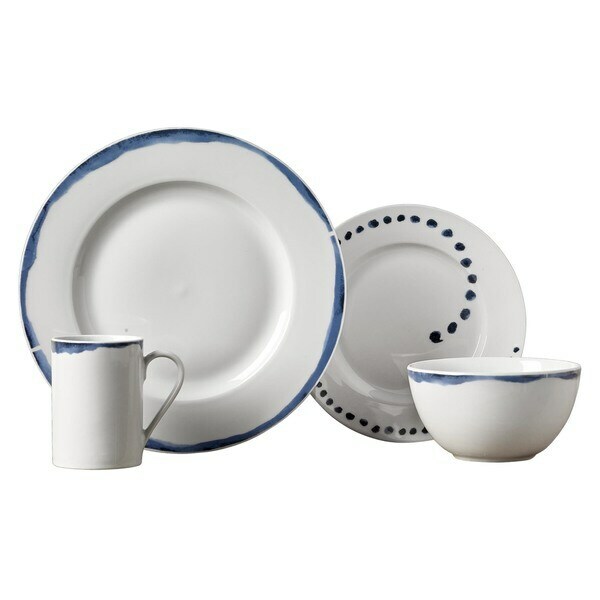 This Isla Porcelain Round Dinnerware Set is perfect for your healthy casual lifestyle. Made from white porcelain as nature intended - with no whitening agents or metal-based color additives, it exceeds Prop 65 and FDA standards. Isla is strong enough for everyday use, yet fashionable enough for casual dining and entertaining. Classic round bodies showcase fresh contemporary Striped Edge or Spiral Dots pattern design for a touch of class that complements any table setting and presents beautifully. I really love this dishset. I’ve been looking for another set with a different pattern to put in with my other dishes so they have an eclectic vibe. When I purchased these I got them for a wonderful price. When they were delivered and I pulled them out of the boxes I liked how the dishes had a nice weight to them. I am obsessed by the pattern. It’s simplistic organic pattern follows very beautiful on each piece. This dishset has turned out to be a fan favorite with myself, family, and guests. I’m very glad that I purchased these!!! They are a lovely set of dishes. I do not have a dishwasher,so Im not sure how they hold up. These plates are so pretty! The dinnerware you eat off of is almost as important as the meal itself. This guide will help you find the perfect dinnerware for your home dining experience. Not everyone has large gatherings for Thanksgiving dinner, so we decided to give you five tips for creating an intimate yet glamorous table setting this season. How to Tell If Something Is Microwave Safe from Overstock.com. Many containers and dishes are considered microwave safe; however, if you use the wrong container or dish, you could ruin both the dinnerware and the dinner.